The ShowDown Town free concert series is a great place to relax and enjoy live music on Thursdays during the summer in Eagle. Ask anyone from Eagle and they’ll likely tell you it’s one of the best towns in the world for easy-going, down-home traditions that everyone can enjoy. On top of that list is the ShowDown Town free summer concert series, presented by Kaiser Permanente. The family-friendly concert series has been livening up Eagle Town Park since its inception more than 30 years ago. Brought to you by the Vail Valley Foundation as part of its mission to enhance quality of life through arts, athletics and education programming, ShowDown Town is one of those simple Eagle County pleasures. Here are six reasons to head on down to Eagle for ShowDown Town. When the music strikes up, it’s always the little ones who break the ice on the dance floor. But what kind of motion can mom and dad put in the ocean? Kids may have the advantage when it comes to selfless bravery, but mom, dad (and uncles and aunts) have got years of experience on the dance floor, so why not get out there and show them what you got? Nothing brings a smile to the little one’s faces quicker than when the adults join them for a little swing, foxtrot, tango or — best of all — a little freestyle. Have any of you found a way to put into words how beautiful it is in our little part of the world when the sun is low in the sky and that evening breeze comes easing down over the mountains like a sweet secret message from the goddess of summertime? We haven’t either, but it’s pretty much the main reason we all live or visit here, and it’s on full display on those Thursday evenings when the band strikes up at 6:30 at ShowDown Town. Once you get through that work day, that bike ride, that river trip, throw a cooler in the truck/car/back of the bike and head on down to the Eagle Town Park for ShowDown Town. Speaking of which, toting along a cooler is part of the ShowDown Town tradition. Fill ’er up with snacks and treats for the kids, and something for mom and dad, too. Just remember that under Colorado state law, only non-alcoholic beverages or 3.2 beer are allowed in public parks — including Eagle Town Park for ShowDown Town events. So, bring that cooler along, but make sure to follow state law on this issue — organizers are asking concertgoers to pay close attention to this one. The toughest thing about ShowDown Town is making your way toward a nice little picnic spot. It ain’t too tough, right? But along the way you’re going to see pretty much everyone you know, who stops you along the way. So make your way through the social gauntlet, spread out that blanket, set up chill-time headquarters,and then get out there and liaise with your neighbors after you’ve set down that heavy cooler. Number one, it’s the neighborly thing to do. Number two, you can finally get that compound mitre saw back from Steve, who borrowed it ages ago to upgrade the fascia on his house, but somehow managed to keep it around all winter while he finished out the baseboard in his basement. Anyway, it’s time to get that thing back so you can lend it to Julia, who is redoing her kitchen. Just take a moment to look at the band lineup, then compare it to the ticket price. Wow, right? Not only will there be rockin’ local legends like Schwing Daddy, but there will also be the amazing Widespread Panic keyboardist bluesy revival with Jojo’s Slim Wednesday and so many more fantastic musicians coming to Eagle for the event. Come on out and enjoy music as it was meant to be, by the people and for the people — all for your listening enjoyment. That’s right: all of the ShowDown Town concerts are free and open to the public. Thanks to sponsors, the series continues to be free of charge. 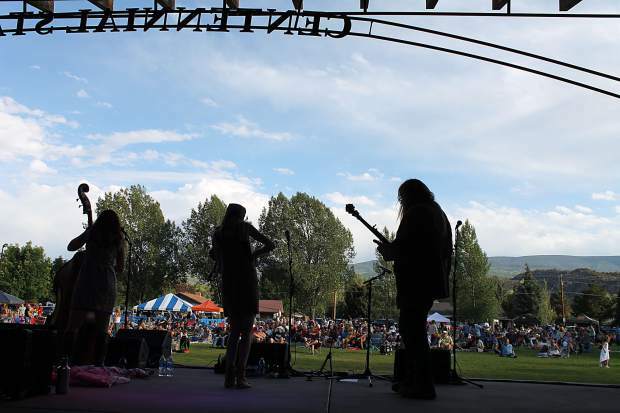 The Vail Valley Foundation organizes free concerts year-round in an effort to provide artistic, musical and cultural experiences to the Vail Valley community. With an amazing lineup of bands, a fantastic outdoor venue and a laid-back vibe, the ShowDown Town concert series is not to be missed this year.